I've had my eye on that red cabinet and dining table for over a year now - I just love the pop of color from the cabinet (and since we're losing a lot of closet space by moving here, any added storage is always a plus! ), and I think a round dining table would be a nice change from all the rectangular and square furniture we have. That plant stand is too cute and we can never have too many of those. The coat rack is a must, now that we'll have a long hallway to our front door and no closet to hang our coats or my purse in! I also think the red bench would look really neat in that same hallway, and would be functional for putting our shoes on or storing some underneath. (Really though, that's only because I saw this.) And then there's the bed sheets, which Shawn is not a fan of but we can't seem to find any linens we can agree on. 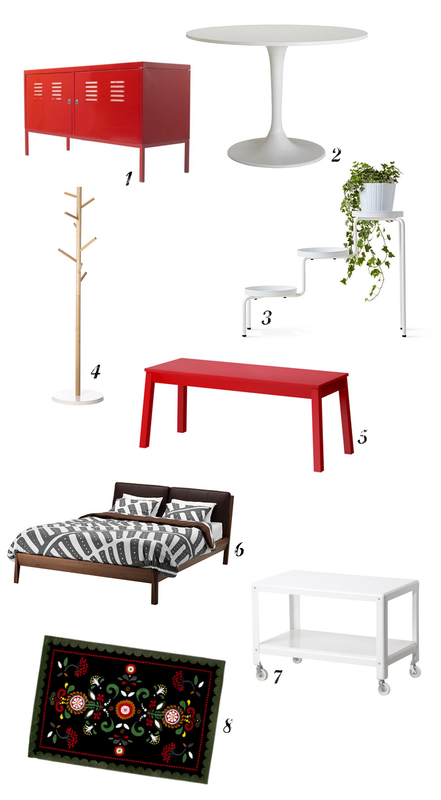 (He says they're too simple but I think simple is great for the bedroom!) I love the coffee table, mostly because it's on wheels but also because we've been using our coffee table as a tv-stand and man, I really just miss having a coffee table to put my drinks and books on. And the rug is one we can both agree on, though we'll need more than that to fill up some floor space in the new place! Tomorrow begins the grueling (yet exciting) task of moving! I suppose that means I should start packing things today, hm...? I LOVE Ikea! So much so that our house has pretty much turned into an Ikea showroom! But I'm okay with that. I have always wanted a red piece of furniture, I think it would be such a neat statement piece. Can't wait to see what you end up getting! Yeah our place is pretty much an IKEA showroom already... so what's a few more pieces? ;) Hopefully we get a chance to go soon!